Despite the numerous benefits associated with trees, sometimes they can pose a serious safety hazard and may need to be felled. To ensure that this is done in a safe and efficient away, this is best left to professionals like Tree Services Annapolis. Our experienced arborists are highly trained and will make the right diagnosis and provide a lasting solution for your varying tree needs. A lot of factors such as equipment, types of trees or techniques come into consideration when it comes to tree removal. For your Annapolis tree removal services, trust our professionals to give you proper unique evaluation at the best affordable rates. The following are some of the reasons you might require tree removal services. You may have a dying tree in your backyard and be completely clueless about what to do about it. The leaves turning brown, falling limbs or even bare branches is an indication of a declining tree. For the removal process to be made safer, easier and more affordable, removal should take place before it dies completely. Signs accompanying dead trees include the dropping of large limbs, absence of leaves where they were previously present and large bark pieces separating from the trunk. This requires special equipment for removal especially if it’s left for too long. The cost of removal will also increase so it is advisable that the tree is removed as soon as possible. Keep an eye for decaying roots, vertical or lateral cracks in tree trunks, abnormal growth patterns, and the presence of diseases and cavities on trunks. For trees to grow well, they need ample space whereby they don't have to compete with each other for resources. To encourage the proper growth of trees, other trees may need to be cut down. Different designs may require removal of trees and therefore our professionals work with our landscape architects to give you the desired look for your home or work premises. Below are the techniques used in the tree removal process. This is the first step in bringing the tree down. Our professionals will check for the height of the tree, space, and stability. In crowded areas where there is not always enough space, it will be cut down in bits. Proper evaluation is needed in this process hence for your Annapolis tree removal services, Tree Services Annapolis has got you covered. This procedure is mostly used for trees that are close to obstacles, power lines, and structures. The limbs are usually removed first, followed by the trunk which is cut into smaller pieces. The trunk is either dropped or lowered with ropes depending on the space available. There is always a landing zone for all the cut limbs and logs. Skilled climbers and grounds personnel are actively involved in this stage. This is the safest method for Annapolis tree removal services. Space must be created for the setting up of the crane. Depending on the height of the trees, the crane must be within a specific radius of the tree to be removed. This makes it easier to pick up the tree. Once the climber makes his way to the top of the tree, he will give a go ahead for tension to be applied by the crane operator. He then makes his cut and the cut section is moved to the landing zone. It is a continuous process until the whole tree is removed. Our ground personnel get to work and in a well-organized manner that enables them to dismantle even the largest of trees in a short time. Nothing goes to waste as it is either turned into usable mulch or logs. The yard is then raked and cleaned up leaving no trace of previous activity. 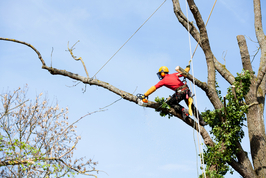 Tree Services Annapolis gives you a safe, affordable and fast Annapolis tree removal services. We have the right equipment and certified personnel to handle any tree removal projects you might have. Do not hesitate to get in touch with us for evaluation and expert advice for your trees.